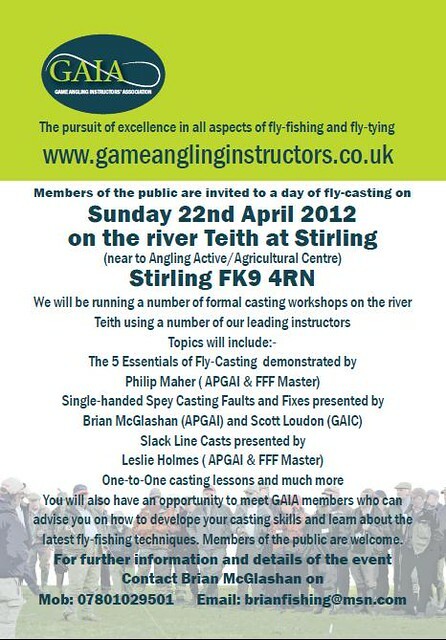 The Scottish region of GAIA are holding an open day event on the 22th of April in Stirling. The event is a CPPD day for members and all members of the public are welcome to come along. There will be an opportunity for one-to-one tuition from instructors, a number of workshops, demonstrations, casting games with prizes as well as the opportunity to try out all sorts of tackle. I even get to make a shameless plug here as I’m giving a demo on single handed speys along with Brian McGlashan. Here’s the flyer for the event, if you’re interested let Brian know as soon as possible.